Murder to Measure can provide half or full day mysteries suitable for schools, colleges and other youth groups. The focus of such events tends to be upon the solving of clues and team-work, and can be adapted to any age group or aspects of the National Curriculum. This is particularly suited for science projects, but many themes can be explored. 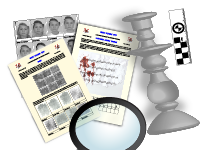 The event usually begins with the discovery of a crime (for younger groups this need not be a murder) and the pupils are then split into groups to investigate the clues found at the scene. These clues may be in the form of fingerprints, footprints, documents etc and the teams may use a variety of methods to rule suspects in or out of their enquiries until the guilty party is revealed. The investigation is carefully tailored to the age-range of the children and can be designed to stretch even the brightest pupils. Such an event can usually be facilitated by a single detective, with school staff over-seeing the activities, although we can provide additional facilitators if required. Clues may be investigated in a single large hall, but if other rooms are available we can put them to good use.